Setting up a GST split in a coding rule means that every time a transaction or invoice fits the rule's criteria, it will automatically split the amount between business and personal. TIP: Before you get started, we strongly recommend you have a conversation with your accountant about the portion of business GST you can claim on farmhouse expenses. The example below shows how to split the GST on house electricity between business and personal in an invoice and the process for a transaction is similar. Click on Invoice coding rules. You'll need at least two criteria, one looking for the other party in the invoice, and the other looking for specific text in the invoice line. Click Add Criteria for additional options. 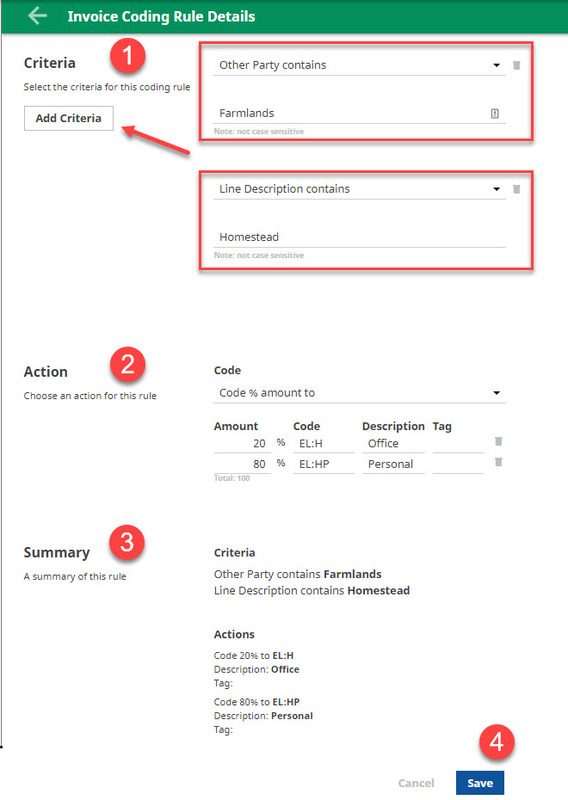 Set the Action as Code % amount to and list how you would like the invoice line to be dissected. TIP: Use the codes shown below for farmhouse electricity. We've already set up the code EL:HP (Electricity : House Personal) with the Personal GST type for you. You can leave the Description field empty so that the details on the invoice line stay, or you can put in your own description. Check that the coding rule has been set up correctly.